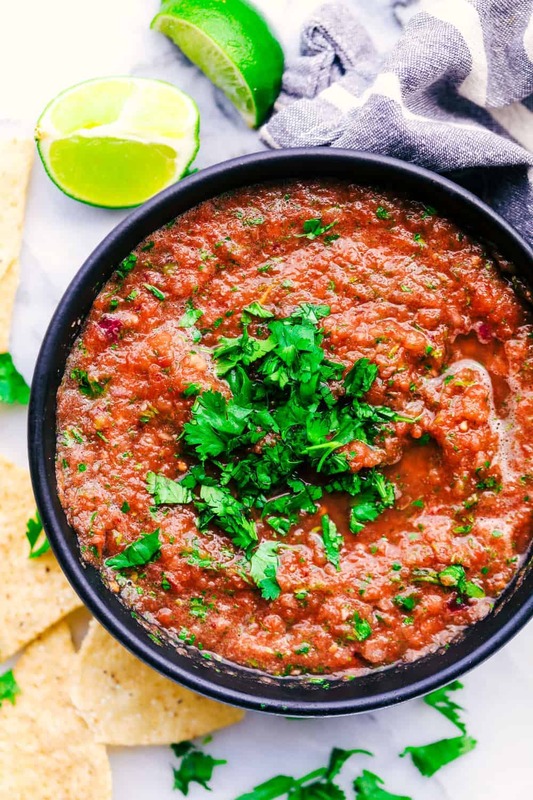 Best Blender Salsa is restaurant quality that is made right in your blender! It only takes 5 minutes and is truly the very best out there! There is nothing better than going to a good Mexican restaurant and eating all of the chips and salsa in sight. 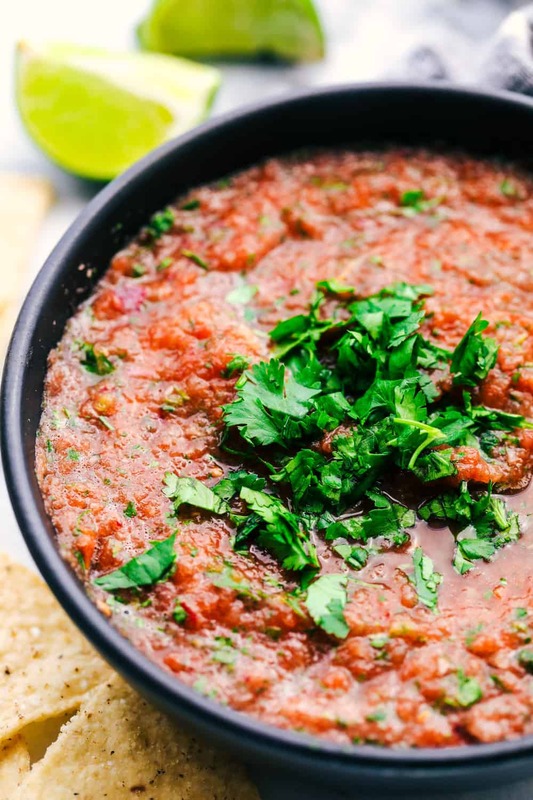 Fresh homemade salsa is thee best and I especially like making a big batch at home. What is it about chips and salsa that is so good and addicting? I especially love eating salsa with some whole grain chips for a healthy snack. This salsa is perfect and honestly the BEST that I have tried. I have been making it for a while now, but I think I have perfected it and made it the very best. And with a few ingredients, 5 minutes of your time, you will be having all of the chips and salsa that your heart desires! How do I make blender salsa? In a blender or food processor add tomatoes, onions, jalapenos, garlic, cilantro, cumin, salt and lime. Refrigerate for at least 30 minutes to let the flavors blend. 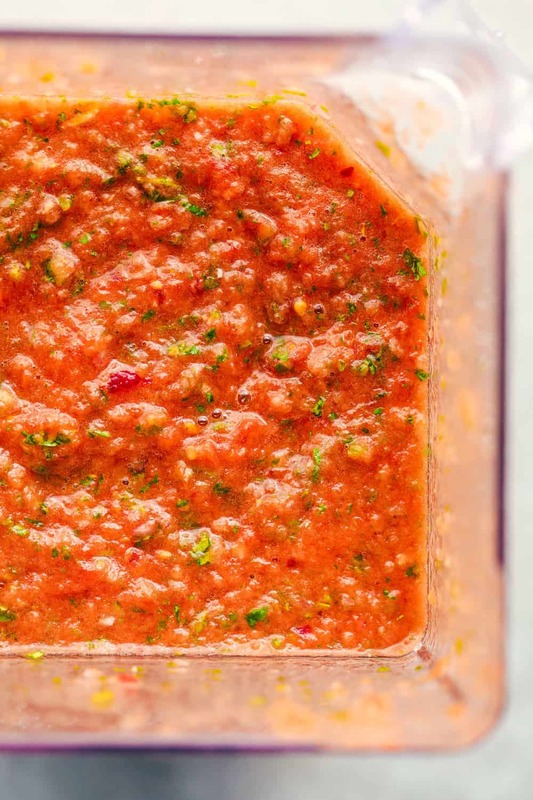 How long can you keep salsa in the fridge? Store the salsa in an airtight container for up to two weeks in the fridge. Is it OK to freeze fresh salsa? It may not look as fresh and perky as fresh salsa, but it can definitely be done. It is a great alternative to canning. There will be some watery liquid after it is thawed but you can drain off the liquid. 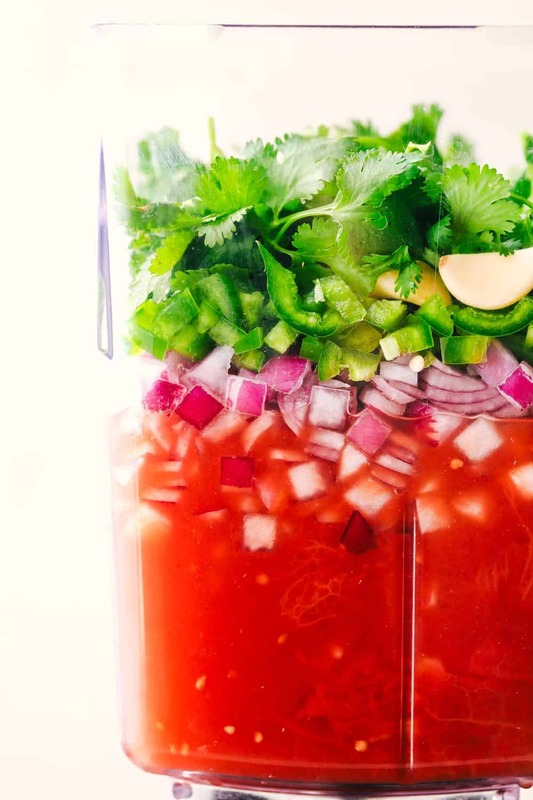 In a blender, or food processor, add tomatoes, onion, jalapenos, garlic, cilantro, cumin, salt and juice of one lime. Blend until the salsa is as chunky or smooth as you would like. Taste and add more salt if desired. Chill for at least 30 minutes or overnight. This is a great salsa recipe. I live in El Paso, TX, and LOOOOOVE homemade salsa. When I do it, I also add tomatillos and banana peppers for added levels of flavor. Love seeing your posts. Keep cooking!!! We’ve been making Salsa for years, & was surprised that there was no mention of what it is that makes the BEST Salsa…the tomatoes used in it’s construction. Garden grown, ripe & fresh tomatoes are the best..& if you want the absolute best,try useing Heritage Brandywine tomatoes. Though not as pretty as a Beefsteak, they have better flavor, fewer seeds, & more pulp with less moisture, than the other strains of tomatoes we’ve tried through the years. I have yet to try these recipes but I review many recipes and these appear to be very interesting. I am certain they will prove to be excellent.